Graduate programs in Samford University's Ida V. Moffett School of Nursing climbed to number 24 for online education in new national rankings released Jan. 8 by U.S. News & World Report. Samford was in the top 25 percent of all the accredited nursing schools included in this year's overall rankings. Samford was number 35 in last year's rankings. Online programs within the nursing school offer master's level degrees in family nurse practitioner, nurse educator, and health systems management. Samford's also offers the doctor of nursing practice as a distance learning degree, but doctoral programs were not factored in the latest U.S. News rankings. "This recognition affirms the faculty's commitment to providing quality online education in an environment that fosters student engagement and positive student outcomes," said Jane S. Martin, Ida V. Moffett School of Nursing associate dean. "Our alumni consistently rate the graduate faculty as highly accessible and deeply invested in student success. We are proud of the exemplary programs we have developed and the graduates who go on to achieve their career goals." Enrollment in Samford's graduate nursing programs has increased significantly in the last decade, including more than 20 percent in the last five years, Martin said, with the availability of online courses and expansion of graduate programs as two of the factors in that growth. Total fall 2013 enrollment was 705. A total of 271 were enrolled in graduate programs and the school awarded 136 graduate degrees during the 2012-13 academic year. 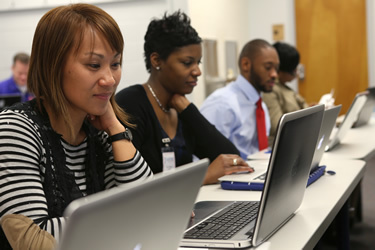 The U.S. News rankings are based on five criteria: student engagement, faculty credentials and training, student services and technology, peer reputation, and admission selectivity. Martin noted that Samford had especially high scores in faculty credentials and student engagement. According to U.S. News, a distance learning program is "a program for which all the required coursework for program completion is able to be completed via distance education courses that incorporate Internet-based learning technologies. Distance education courses are courses that deliver instruction to students who are separated from the instructor and support regular and substantive interaction between the students and the instructor synchronously or asynchronously." Other Alabama schools in the rankings are University of Alabama-Huntsville (6), Troy University (52), University of South Alabama in Mobile (56), and Spring Hill College in Mobile (82). Samford was the highest ranked of its peers in the Southern Conference and among historically Baptist colleges and universities.